Most if not all readers of GeekTonic love their media gadgets. And many of you have some a lot of them. To give you an opportunity to share with everyone your collection of media tech and home theater setups, I've decided to start a new series where you, the reader are the star. Free Stuff: For each post in the series at GeekTonic, the submitter will be entered to win one of two $25 Amazon.com gift certificates. I have a few additional prizes in the works and I'm hoping to get a sponsor or two to make the prizes bigger but for now the $50 donation from me should get things started. The drawings will be held in November/December and anyone who has made a submission (or two) will be entered to win. Your Name in the Lights: If you're wanting to get some attention - perhaps you'd like a link to your blog, more twitter followers or just want to see your name on GeekTonic - I'll do any or all of these things if your submission makes it to GeekTonic. Share Your Stuff and Help Others: Let's face it, you have some cool stuff. Maybe it's just a Zune, iPod or cool Blu-Ray player or possibly you have an elaborate HTPC setup you'd like to share. No matter what its stuff that all of us would love to see and read about. And you'll probably be helping others too by showing them what you use for media technology and how you use it. Entering and sharing is easy. Photos - the GeekTonic Flickr Group: First off, photos work best for this sort of thing. Either use your existing flickr account or sign up for a free one. Then join the GeekTonic Flickr Group here. Once you're a member of the flickr group, submit the photos into the GeekTonic Flickr Group. Ideally put a short description or at least a title for each photo so we know what it is. If your anti-flickr I'll still accept your photos - just send me a note so you can e-mail them to me or send me a link to where you have them available. Send me a note once you've submitted photo/s to the flickr group so I have a way to contact you. Write-Ups - Send me a note: If you have a little something you'd like to say about the photos you've submitted, or tell me more about the setup or gadget, or even how you use it just send that to me in an e-mail. I use contactify to week out the spammers so send me a note first and I'll respond with my e-mail. So get out those cameras and start photographing your stuff. We're anxious to see all of that cool gadget goodness you have to share! I already have submissions for the first two in the series so you can get an idea of what I'm looking for. 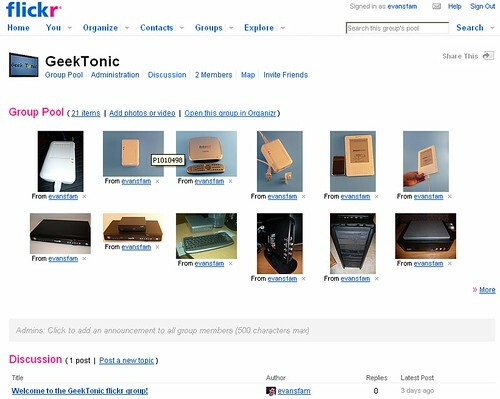 Don't hesitate to start submitting your photos to the GeekTonic flickr group now.